Saints and Sinners explores the style, subject matter and social function of religious art in Italy circa 1580 to 1680, a period traditionally called the Baroque. The exhibition presents thirty Baroque paintings from both public and private collections. The visual centerpiece is the recently rediscovered masterpiece by Michelangelo Merisi da Caravaggio, The Taking of Christ. Painted in Rome in 1602, it disappeared in the late eighteenth century. Two hundred years later, in 1993, it was rediscovered in the dining room of the Jesuit Fathers in Dublin. Cleaned and restored, it now hangs on loan in the National Gallery of Ireland, where it has been received with world-wide jubilation. 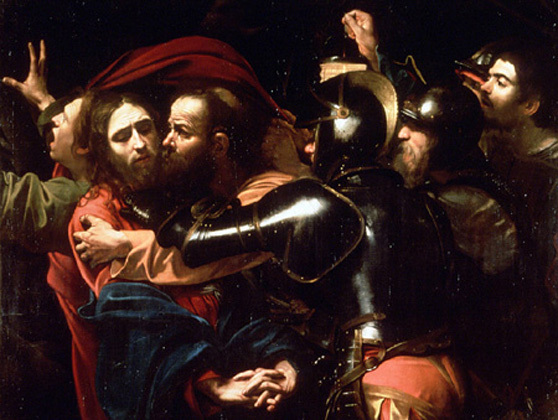 The Taking of Christ makes its first North American appearance at the McMullen Museum of Art as a result of a special concession granted to Boston College by the Society of Jesus of Ireland. A group of scholars has come together from diverse academic disciplines to serve as curators for this exhibition, reading the art of Caravaggio and other major Italian Baroque painters, including Guido Reni, Domenichino, Ludovico Carracci, and Pietro da Cortona, from new, hitherto ignored or little explored perspectives. Edited by Franco Mormando, S.J.